Brand new from www.GlosJobs.co.uk, you can receive the latest jobs to your email inbox at 5.30pm every day. 2. Click on the grey banner at the top of the page. 3. Input your name and email address. 4. Check your inbox and click the link. 5. Choose all the categories from which you would like to receive the latest jobs. 6. Please click the “browse more jobs” button below to start your job search. 7. Check your inbox at 5.30pm every day. 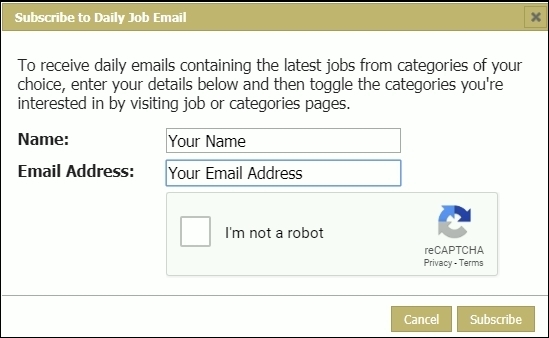 You will be emailed with all the new jobs added to your chosen categories at 5.30pm every day. If you have any comments or queries, please let us know on office@glosjobs.co.uk or 01242 236608.